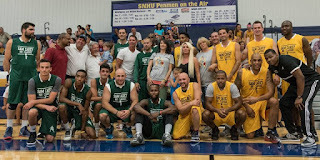 This past Friday night was the 5th annual Sam Carey Classic, held at Southern New Hampshire University in Manchester. Mike Stys in conjunction with Luke Bonner and the Rock On Foundation do a great job with this event, which honors and the memory of the late Sam Carey. 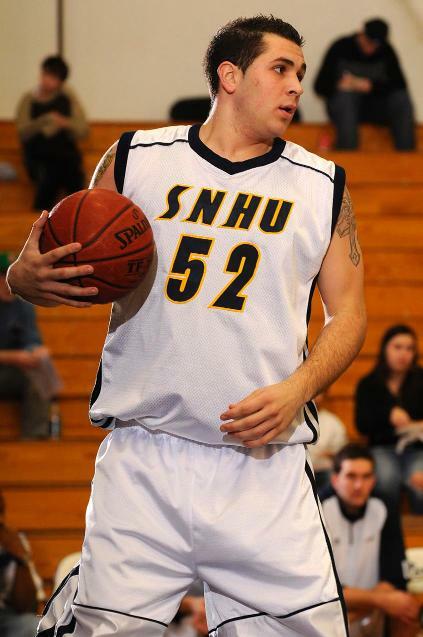 Carey, a former standout forward at Manchester Central and SNHU lost his life in a motorcycle accident in 2011. Proceeds from the event support Carey's family, and also to the Rock On Foundation which builds and renovates basketball courts for the area's youth. 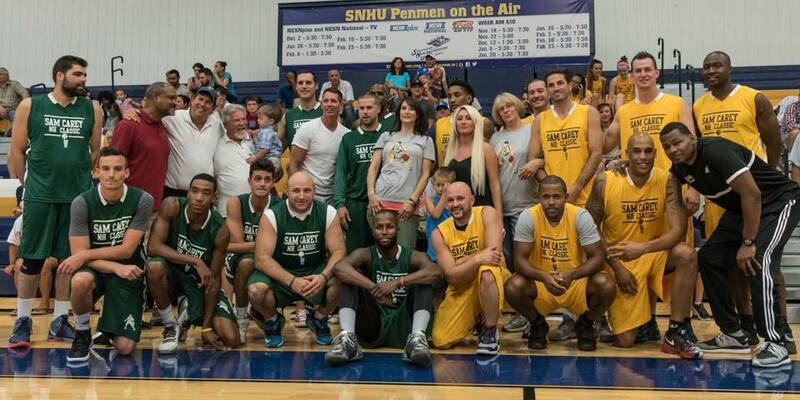 It's a great cause and fans get to see some great basketball as well. This was the first year that the event featured a girls all-star game, in addition to an alumni game and boys all-star game. Between the girls, boys and alumni, never before has there been that much NH hoops talent playing on the same court on the same night. It was truly a historic night for NH basketball. All three games were oozing with local talent and were played at a high level. If you add up the money in scholarship offers from all the NH boys & girls who played Friday night you could solve U.S. debt. It's crazy to think of all the talented local players in the Classes of 2016, 2017, 2018 and 2019. It is the golden age for NH basketball. First, let's cover the boys all-star game. Even before tip-off, you already knew this was a special game. 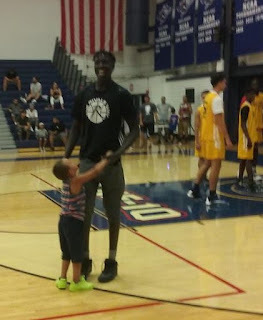 Coaching on the sidelines for the Gold Team were 7-foot-1 Luke Bonner (Trinity HS, Umass, Virginia) and his assistant 6-foot-10 Wenyen Gabriel (Trinity HS, Kentucky, top 10 recruit in the country). Coaching on the opposite sideline was Nashua's Kaleb Joseph (transfer to Creighton). As for the players on the court, local fans had to be watching out for the backcourt duo of Geo Baker (Derry, NH) and Caleb Green (Londonderry, NH). The two friends grew up playing together and just in the past couple of weeks both have accepted D-I offers to Rutgers and Holy Cross, respectively. Baker, Green and fellow Proctor Academy teammates Tshiefu Ngalakulondi (Manchester, NH) and Bol Akot (Manchester, NH) were all on the Green Team. It was the Gold Team that prevailed though, 89-72. They were led by 6-foot-7 wing Monytung Maker (Manchester, NH), who dropped a game-high 20 points. Maker attacked the rim all game long, ran the floor well in transition and played hard every minute he was out there. Maker, who will be a senior this year at Brad Christian Academy, was as good as any player on the court. He came into the event with two scholarship offers (D-I Towson University and D-II Post University), but based on his performance on Friday night it was clear that more offers would be coming Maker's way. So it was no surprise when later Maker announced on Sunday via Twitter that he had received his third offer, from Kentucky State University. "I was on a mission" said Maker post-game. "I had something to prove. Everybody's saying that I'm a 4 at the next level, but I want to show that I can play the 3 or the 4. I can face up and play outside." Maker's AAU coach Vin Pastore with the Rivals Basketball Club has tweeted that Maker is as hard of a worker as he has. It's great to see that hard work paying off. Speaking of hard work paying off, you had to be impressed with the game that Green had. His team lost, but Green dropped a team-high 18 points and simply could not be guarded off the dribble. Green hit a couple of jumpers, but most of his points came by blowing by his man off the dribble , getting to the rim and finishing over bigger defenders. "It's that first step" Green said with a smile. Green will likely be the best player under 6-foot to ever come out of NH. Both Green and Baker owe much of their success on the court to their trainer and AAU coach TJ Thompson, calling him the best trainer in New England. Maker dropped 20 points, Green had 18, Baker had 10 and Ngalakulondi had 6. Maker has 3 D-I offers, Green has committed to Holy Cross, Baker to Rutgers and Ngalakulondi has a whopping 17 offers. They haven't started their senior year yet, but already know that all four of them (2 from Manchester) will be D-I college players. Other standouts in this game on the NH side (the Gold Team had 4 local players and the Green team had 8) were Keigan Kerby (8 points) and Akok Akok (11 points). Kerby (Hampton, NH) enters his junior year at Brooks School. He holds offers from American U, George Washington, UNH and Bryant. Kerby showed a lethal face-up game, with the ability to both drain the 3 or take it strong the rim from up top. 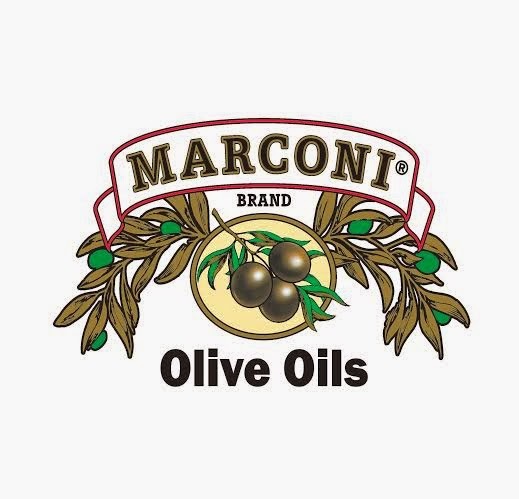 He hit 3's off the catch or off the dribble and also blocked shots. 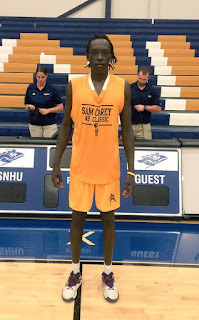 Akok (Manchester, NH) meanwhile was a menace on the offensive boards, finishing tip-ins inside, hitting shots outside and blocking shots. Akok is a definite scholarship prospect, but he is still very young. Akok announced via Twitter recently that he is transferring out of Manchester West and headed instead to Putnam Science Academy, where he'll repeat his sophomore year and reclassify to 2019. Meanwhile the Nashua duo of D.J. Frechette and Ronnie Silva also played well. Both players showed lightning quickness as well as the ability to shoot from downtown and slash to the rim. Frechette (11 points) transfers from Nashua South to Governor's Academy, while Silva (5 points) transfers from Nashua North to Bradford Christian Academy. Also in action for local talent was 6'5" wing Brennan Morris, Paul Rodolf, Bol Akot and Tiong Bol. Morris hit a tough step-back jumper, while Rodolf chipped in with 9 points in the win for the Gold Team. Akot held his own out there, despite being at least 2 years younger than everyone else on the court. 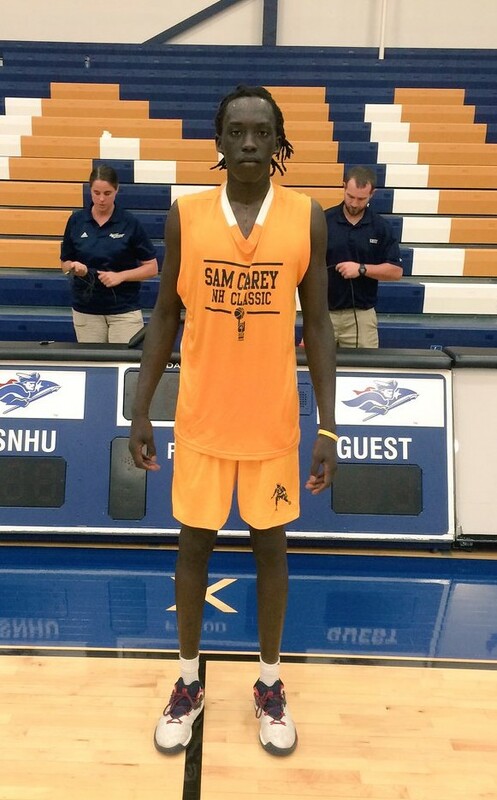 Akot was playing middle school ball last year. This year Morris is doing a PG year at Loomis Chaffee, Akot will be a freshman at Proctor, while shooting guard Rodolf and forward Bol are both transferring to Berwick Academy. The boys all-star game was preceded by the main event - the alumni game. Some of the local talent on display included William Dileso (SNHU), Troy Bowen (SNHU), Keith Friel (Virginia), Pat Luptowski (St. Anselm), Paul Chergey (SNHU), Austin Denton (NHTI) and Chis Burns (Bryant). Burns was knocking down 3's left and right once again. He made national news last year by becoming the first openly gay Division I college basketball coach in the country. His courage should be applauded. This was a hard fought game, with the Green Team winning 92-87. They were led by SNHU recent grad Rodney Sanders, who was a D-II all-american player last year. He leaves big shoes to fill for the Penman, but they still have Devin Gilligan (Amherst, NH), Quentin Bullen (Exeter, NH) and incoming transfer Dimitri Floras (Merrimack, NH) to fill the void. Scott Hazelton and Miguel Gonzalez played well for the Gold team in defeat. They run the Rivals program (along with Pastore) and put on a good show with many of the kids who play AAU for them watching on. Hazelton (a former McDonald's All-American) is in the best shape he's been in years. What fans will likely remember most from this night is the touching moment prior to tip-off of the Alumni Game, where the alumni players were exchanging hugs and handshakes with Sam Carey's family. They will also remember seeing the insane amount of NH talent that was in the house. Bonner, Gabriel, Joseph, Baker, Kerby, the list goes on. Gabriel was there supporting his friends and flashing his smile, just days before headed back to Kentucky. He'll have everyone in NH watching him play for the Wildcats, as he chases his dream of one day playing in the NBA. "I don't think about it, I just focus on the task at hand" said Gabriel. "I spent my whole summer down there, practicing and building relationships with my teammates. Now I'm going to try and earn my spot." When I first saw Gabriel play he was 6-foot-2 as an 8th grader playing AAU for Bishop Elite. He played JV as a freshman at Trinity and came off the bench in AAU during the summer before his sophomore year. Now he's a top 10 national recruit in the country, headed to Kentucky. Yeah, it's a good year for NH basketball. Write-up on the girls game will be posted shortly.